British troops huddle in a trench on the Western Front. “In Flanders Fields,” by Canadian soldier John McCrae, has survived time’s pull. A hundred years after the raging guns ceased and the ashes of war swept over millions of tombstones, the words still haunt. But the poem’s background makes it even more harrowing. McCrae died in 1918, another casualty of the senseless, horrific acts of mankind. 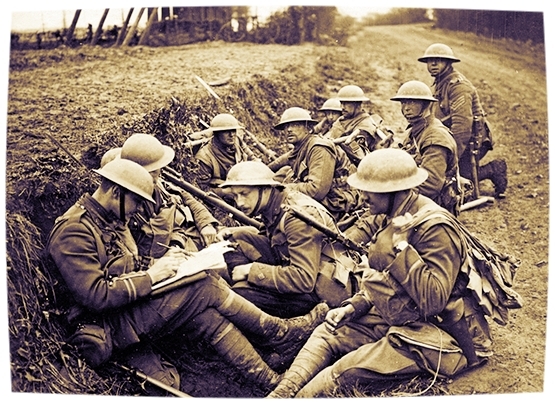 World War I—the Great War—has been over for a century. Most of its stories don’t recall the triumph of good over evil, as in World War II, nor do they give off the chivalrous tone that framed 19th-century conflicts. There was no Hitler to defeat, and little distinction between black and white, right and wrong. The world witnessed the sickening consequences of modern warfare. There was no precedent for such horror. The men who fought in the Great War couldn’t anticipate the destruction they would both cause and endure; never before had life been wiped out in such magnitude and across such a vast stage. There were an estimated 18 million deaths and 41 million casualties from 1914-18. Soldiers naturally sought ways to cope with the trauma. Some, like McCrae, leaned on poetry. Their words form a final testimony modern readers ought to heed. The poems pierce our modern veil, reminding us of what has changed in the past century, as well as of eternal truths. A young nurse named Vera Brittain penned one such poem, “Perhaps,” upon the death of her fiancé. The last stanza: “But though kind Time may many joys renew / There is one greatest joy I shall not know / Again, because my heart for loss of You / Was broken, long ago.” The war accentuates a feeling of loss that nonetheless is familiar to readers in any era. Many of the most famous poets were killed in the war they memorialized. Rupert Brooke, who wrote of a “corner of a foreign field that is forever England,” died in Greece in 1915. Charles Hamilton Sorley’s poem “When You See Millions of the Mouthless Dead” was discovered the same year alongside his corpse. Alan Seeger, famed for “I Have a Rendezvous With Death,” was gunned down in 1916. Edward Thomas, who wrote “Gone, Gone Again,” died in 1917. The list stretches on and on. 'Gassed' by John Singer Sargent depicts soldiers dealing with the effects of mustard gas. Never before had war been documented to such a degree in poetry, and it is unlikely that it ever will be again. Faced with the terrifying prospect of death in the trenches, soldiers scribbled down their rawest emotions. These are the tortured accounts of men awaiting their turn to die or recording the deaths of others, unsure when their rendezvous with death and passage into God’s remembrance would come. The men who fought the Great War did not die in vain, and the bleakness of these poems—the Latin phrase Owen calls a lie means “It is sweet and fitting to die for one’s country”—should not be interpreted as lost hope for the human race. But a century later, it is beneficial to see the naked emotions of war when attempting to understand the era. These are the real, honest accounts—not a page from a textbook recalling events at a remove. Their words are true; they show the horror of war more accurately than any documentary could begin to convey. The words call us to pay heed, they offer lessons, they haunt. And haunted, we remember how it was the “war to end all wars,” the final ultimatum. We remember, and we laugh, we weep, we fail to understand. Dulce et decorum est, indeed.